My knitting has slowed down recently because I took a second job to pay off my credit cards. Such is life in modern America, unfortunately. 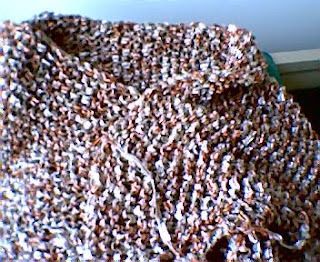 However, I did manage to finish a triangle shawl made with Katia Tango, a ribbon yarn, in the rust color way. I haven't woven in the ends yet, and you can see one trailing off to the side. I just did garter stitch and increased one stitch at the end of every row and kept going until I was nearly out of yarn (I used 4 balls of 71 yards each). I've also been working on a new scarf for myself. I'm making 3 long skinny stockinette tubes (just 20 stitches across; size 8 needles). When they're done, I'll tie them together and braid them. 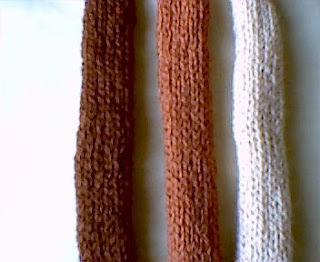 The yarn is Palette by Knit Picks; the colors are wood, fawn, and tan. If this one turns out well, I plan to make another one with bark, nutmeg and twig. I think a black, white, and gray one would look sharp, too. That's all for today, my friends. Hope your fall knitting is going well and that you have a happy, safe Halloween.